I was privileged to be Ted’s friend for many years, especially in our years at the Council on Foreign Relations. He loved that organization and Gillian and I wondered if I might recount some of our experiences at the Council. Ted was a man who took part. He didn’t just show up. He made a difference. Ted attended over 1,000 Council meetings. No one else I know comes close. Ted was also the featured speaker at an astonishing 18 meetings. The extraordinary range of subjects he spoke about is a metaphor of the unique breadth and depth of Ted’s interests in foreign policy, public policy, politics and the nexus therein. Ted also presided over another 28 Council meetings. I paid a heavy personal price for these on more than one such occasion. Ted loved to roast, and the more you loved him, the more he roasted you. Council members knew how brilliant he was and what a good man he was, and they all loved his wit. The Council audience loved it, and loved Ted. Ted had that wonderful sardonic smile, particularly after one of his wry and wicked jokes struck home. I shall forever cherish that smile. At all those Council board meetings, Ted saw problems in special ways, with special solutions, and defined them with special words. Even when he couldn’t see very well, he saw all too well. He was a triple rarity. He was not only one of the greats of his age, he was great fun. And, yes, a great and beloved friend. Ted advised presidents. He encouraged young people on the way up. He counseled those who might benefit from his hard-won wisdom. And in the end, that turned out to be just about everyone he met. What a beautiful mind. What a good man. What an irreplaceable friend. 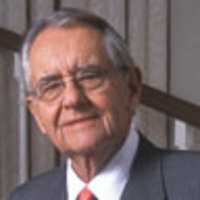 Peter G. Peterson is chairman emeritus and cofounder of The Blackstone Group, chairman emeritus of the Council on Foreign Relations, founding chairman of the Peterson Institute for International Economics, founding president of The Concord Coalition, and retired chairman of the Federal Reserve Bank of New York. He is also the founding chairman of the Peter G. Peterson Foundation. His most recent book, Running on Empty , was a national bestseller.